In Kibaale, I have a propane stove with an oven. It is like a gas stove in that you must lite each burner as well as the oven. There is a difference, however, in that this oven is either on or off…. There is no way to regulate the temperature. In fact, there is no way to know what the temperature is. If I want to bake something I use the top rack and hope that it does not burn; or use the lowest rack to brown foods like making crispy potato wedges. Baking, roasting or cooking in this oven is a BIG challenge and always an adventure. When I think something will be easy to make; it frequently becomes more complicated. I have had to adapt every recipe after numerous burned offerings. One of my favourite recipes is banana bread. Bananas are very inexpensive, readily available, and frequently given to me as a gift. It seems that I always have over ripe bananas. In “Jungle Camp Cook book” by Wycliffe Bible Translators, there is a great recipe for banana bread. I have attempted to make this loaf many times only to discover that the top and bottom are burnt while the inside remains raw. I now made banana bread muffins and they turn out perfect if I bake them for exactly 22 minutes. At 25 minutes they are burnt. I tell you this because one of the Kibaale teachers is interested in purchasing an oven… Patricia wants to learn how to bake fancy decorative cakes. To help me understand exactly what type of cakes she is looking to bake, she showed me a 200 page cookbook with the most beautiful and elaborate cakes I have ever seen. This could easily be a cookbook created by “Martha Stewart”. I told Patricia that she had the wrong person if she wanted to learn how to bake such cakes. BUT then again, I am the only one in Kibaale with an oven. Patricia and I have had many discussions about the stove, how it works, and the recipes in her cookbook. Much of our conversations have been around the ingredients; Patricia did not know what raisins, almonds, dates, icing sugar, candied cherries and mixed peel were nor had she ever tasted any of them. She did not know about measuring cups, teaspoons and tablespoons. Nor did she understand that there is a process when baking a cake… like when they say cream sugar and butter together. All this was new to her. So, before she and her husband make a final decision to purchase a stove with an oven, I thought it would be a good idea for her to do some baking. She wanted to bake a fruit cake like those we enjoy over the Christmas Holidays. I have made a few in the past but quickly realized the store bought ones are almost as good. Unfortunately, that is not the answer. This teacher, Patricia, wants to learn how to bake. Our first cooking lesson was a banana bread which of course turned out acceptable. Her family liked it. Then a few weeks later, she arrived with all the ingredients for a fruit cake. I have to say that our first attempt was a complete failure. I put the cake at the top of the oven and after less than half the baking time, it was black on top, sides and bottom. I carefully removed as much burnt cake as possible before sending the rest home. As she left….. I started to cry. I had just cost her a significant amount of shillings. It does not matter how much it cost in Canadian dollars; I found the price of the necessary items expensive. Here is a teacher on a limited income spending her shillings on costly ingredients which I just burnt. I felt terrible! It was a disaster! So, for the next few weeks, I thought about what I might do to make the next cake a success…. The day after our burnt disaster, Patricia came and told me her family loved the fruit cake much better than the banana bread and they wanted her to try again. On our second attempt at a fruit cake, we did many things differently. First of all, we added extra liquids, then we put the cake on the every top rack of the oven just after I lite the oven… and finally I put a two inch stick at the top of the oven door like a wedge to keep the door open and lower the temperature. We also checked to see whether the cake was done every 10 minutes. After 45 minutes we had a magnificent cake…. SUCCESS at last. Now my story about the “princess cake” begins. Over the Christmas holidays, there were a number of family members visiting from Canada including Carina’s mother and father better know as Mormor and Morfar (Swedish for mother’s mother and mother’s father). Mormor pack one of her suitcase with all the ingredients to make a Swedish princess cake for the Christmas festivities but this suitcase got lost in transit and did not turn up until a few days before their departure back to Canada. I have never heard nor tasted a princess cake but have heard many stories of how it is made and how over the years bakeries are making a simpler version since it takes a long of time and ingredients. Of course, this only added to the mystery of this very special cake. So, last Friday morning as I was preparing to leave Masaka for Kibaale, I remember that I needed to say “Goodbye” to Mormor and Morfar since they were leave in a few days. Just as I was getting ready to walk up and say goodbye, I received a phone call inviting me to coffee…. I thought that it was nice to say goodbye over a cup of coffee…. but little did I know that Mormor had made the princess cake. Out from the fridge came a cake almost exactly like the one in this picture but more beautiful. The mint green marzipan icing had three pink marzipan flowers on top…. It was truly a work of art. How could anyone cut into a cake that majestic!!!!! 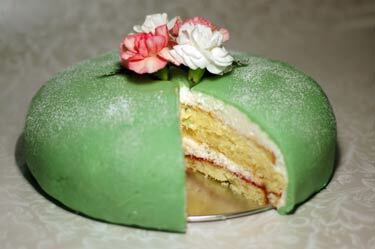 BUT Mormor cut the cake and gave me the first piece of princess cake. I am challenged to find words to describe the delicate taste of the layers of mouth watering sponge cake with fresh raspberries, custard and whipping cream. You have to research this cake to appreciate that this cake would be impressive by Canadian standards but to think that it was made in Uganda with an oven like mine……. what words can I use…. Well done, Mormor.